Over 50 players participated in the Amun-Re tournament this year, down a bit from last year. Most of this can be attributed to the fact that the second heat conflicted with the third Puerto Rico heat. Next year, the GM hopes to do a better job scheduling. Four-player games were played with the same three provinces removed before the game (Abydos, Amarna, and Kharga). Due to the removal of the 4-power-card province from the game, the requirement for the Power Card bonus card was reduced from 7 to 5 in those games. The two heats saw 13 tables in play, with three second-place players advancing as alternates. (With the exception of one four-player contest, all preliminary games were five-player.) Of note was a Heat 2 game with Chris Johnson, Belinda Quimby, Rob Flowers, Daniel Eppolito and Gary Noe, where at one point all five players played their -3 cards on the sacrifice. Amun-Re was understandably miffed. The 16 semi-finalists each played a four-player match, with the four winners advancing. The lead table featured both former champions Arthur Field and Evan Tannheimer, who watched Shannon Beets play a Harvest Increase power card in all six Rounds, as well as an 8 Gold card in three of them. To no avail, however; while Daniel Hoffman had the lead at the flood, Evan edged Shannon at the finish 51-48. The final was a hard fought affair, with the recap posted at http://www.radix.net/~billones/amun_re_recap.html. (Any recapping errors are mine.) 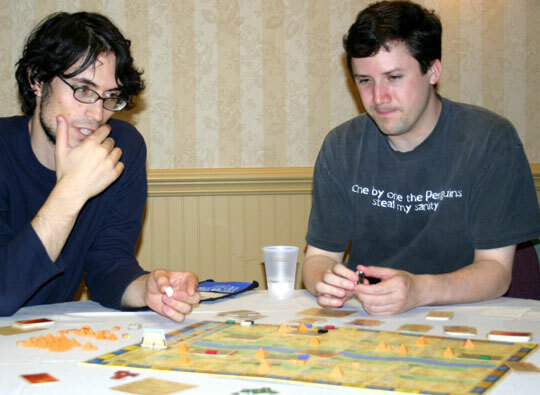 While Davyd Field grabbed the Pharaoh each of the first five turns, and dropped $28 to buy Memphis in Round 6, Nick Anner bought six stones and played a Builder card in his final round, and outproduced him on the last harvest to eke out a 41-38 victory. While going first didn't seem to be an advantage in the Heats (2-2-4-3-2 winner distribution), it did in the later rounds (2-3-0-0). That might be a function of the switch from 5- to 4-player tables, as the 4-player heat was also won by the first player, or it might just be random, since second place was even (1-2-1-1). Only half the games were won by the player with the most total pyramids (9-9), and less than half by the one with the most cash at the end (6-12). However, a lead at the flood proved a good omen of things to come (12-6). The high table score was a 51, posted by both Evan and Nick in the semi-finals. Low score was a 12 during the heats. Table averages in the heats ranged from 30.8 to 39.6, while the semis went 46.8/41.8/36/36 with the final at 35.8.